Cocoa butter is a stable and dry butter. 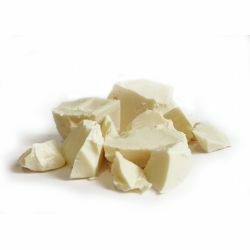 It can be used in combination with other natural butters to create rich blends. In our massage bars - including Wiccy Magic Muscles, Therapy, Heavanilli Massage Bar and Strawberry Feels Forever - cocoa butter works with the other natural ingredients, reacts to the temperature of the body and melts over the skin, making it supple and smooth. We use cocoa butter in our luxury bath melts, Floating Island, Mmm Melting Marshmallow Moment and You’ve Been Mangoed. As they melt in the hot water, the butter disperses and your bath becomes a decadent treat, softening your skin and hair. Our body butters contain a generous helping of this delicious butter. In Buffy, the cocoa and shea butters soften and nourish the skin, while the ground rice, aduki beans and almonds exfoliate and scrub away dead cells.